Netanyahu’s Gaza policies may have staved off war but may have cost him his coalition. Each year on the sixth day of the Hebrew month of Kislev, the day of founding prime minister David Ben-Gurion’s death, Israel’s prime minister – along with the president, opposition leader and security heads –go south to Sde Boker to pay their respects at his grave, and the grave of his wife, Paula. And each year the prime minister, regardless of who it is, cherry-pick something from Ben-Gurion’s legacy to help explain their own current policies. “I stand here at the grave of David Ben-Gurion, the first prime minister of the State of Israel and a great leader of the Jewish people. In times of crisis Ben-Gurion made fateful decisions. Sometimes he did so against popular opinion, but in the course of time, these decisions proved to be correct,” Netanyahu said. His message was simple: Liberman took the low road – the easy, popular route; while he – Netanyahu – is taking the high road, doing the right thing even though it is unpopular, even though it will lead to criticism. WITH PASSIONS fired up over the indiscriminate Hamas attacks on civilian targets, with people’s patience running out after nearly eight months of terrorism from Gaza, the popular path is the use of much greater force against Hamas; at least that is the popular path with the country’s right wing, which supports the Likud, Liberman’s Yisrael Beytenu Party and Naftali Bennett’s Bayit Yehudi. But for Netanyahu the right thing, in his mind, is to avoid a war in Gaza that will lead to the death of soldiers and civilians and leave Israel – afterward – back where it started: with no viable solution for Gaza. Netanyahu said as much in a frank press conference in Paris on Sunday just hours before an apparent intelligence mission inside the Gaza Strip went bad, leading to the killing of an IDF officer and seven terrorists, including Qassam Brigades commander Nur Barakeh. Asked about his vision for Gaza, Netanyahu said there is no diplomatic solution for the coastal strip as long as Hamas – with an ideology committed to Israel’s destruction – rules over it, just as there is no diplomatic solution to Islamic State or Iran, which also want to destroy the Jewish state. And that is Liberman’s problem – the problem he laid out at the press conference where he announced his resignation. Rather than defeating Hamas, Netanyahu prefers – backed by all the top security heads – restoring calm through the use of carrots and sticks, and then reaching an agreement that will buy quiet for an extended period of time. Liberman calls this capitulation to terrorism; Netanyahu has another name for it: a recognition of reality and leadership. Since Liberman’s move will sooner or later lead to an election, the nation will soon be able to decide what they think it is. Netanyahu is already preparing for this, and preparing his arguments. At that Paris press conference he went on record with comments that for the last number of weeks he has been willing to make only in private and off the record, comments that explain his considerations. In Paris to join leaders from around the world to mark the end of World War I – a war in which millions of soldiers marched to their deaths with the initial cheers of their countrymen ringing in their ears – Netanyahu said that just as that war was unnecessary, he felt it his duty to prevent an avoidable war. “Every war brings with it casualties; I do not shy away from it if it is necessary, but try to prevent it if it is not,” he said. Netanyahu then described his considerations, talking about young men who leave their parents and willingly go to war, some of whom do not return. “I see what happens to their families, I see what happens to those youth – it is a very heavy price, to say nothing of civilian casualties. I see that, I live it. That does not prevent me from taking action – we take action when we must, and have done so often, but I always think about this, and I think every prime minister has to think of that. “You are responsible for security, and when there is a need, you send people to risk their lives, and you do it – but if there is a way to prevent that, and to get the same results, that is your responsibility. Will you get criticism here and there? Yes, but for that people are chosen to lead,” he said. In Netanyahu’s mind, if he is able to restore calm through a long-term ceasefire, that is preferable to achieving the same result through a widespread military campaign that would cost IDF and Israeli civilian lives – especially since neither will solve the Gaza problem once and for all. He also indicated during the press conference that he is strong enough politically to pull this off. “At the end you accumulate [political] credit and have to use it on a rainy day, and I am doing that in the understanding that this is my mission,” he said. THIS POLICY, at a time when people are taking to the streets demanding a more aggressive Israeli response, and at a time when there is widespread sentiment that a stronger Israeli response is needed, is a political gamble. For this reason, Netanyahu would prefer to push off the election date for as long as possible, so the events of the last few days recede in people’s minds, overtaken by other events. Which is exactly why Liberman wants an election now, why he forced the issue now. Just as Netanyahu is taking a political gamble believing that restraint will pay off at the polls, Liberman is gambling that pushing the envelope will save his party and his political career. Liberman, in recent weeks, has called for more aggressive Israeli action, pushed in this direction by Bennett. Up until then he was backing what he said was the IDF’s responsible policy toward Gaza. None of this has helped his political standing, as polls over the last few months showed his support declining. Sharon Gal, a journalist and former Yisrael Beytenu Knesset member, gave voice to the disillusionment with Liberman on the Right on Tuesday, going on a rampage against the defense minister in his radio show on Galei Yisrael. Calling Liberman a “toy Rambo,” he said that while hundreds of rockets were fired from Gaza toward Israel, the defense minister sat quietly. Liberman broke his “silence” with his resignation announcement, and though he framed it as a principled act of standing up for his positions, there was seemingly a political calculation as well: defusing arguments such as Gal’s. An instant Channel 2 poll on Wednesday evening showed that the gamble paid off, and that were an election held today, Yisrael Beytenu – which in previous polls was picking up only five seats – shot up to seven, one more than it received in the previous election. The Likud, on the other hand, dropped to 29, one less than its current strength. “We have heard for months that they [Hamas and Islamic Jihad] are conducting rocket tests… this was the first opportunity to use it,” Inbar said of the new missile. Israel’s security cabinet’s decision Tuesday afternoon to walk away from the war Hamas initiated Monday and to accept a “ceasefire” is frustrating and infuriating. Hamas shot nearly 500 projectiles into Israel in under 24 hours. It blew up a bus with a Kornet anti-tank missile. Sixty Israelis were wounded, several critically. One civilian was killed. Numerous homes were destroyed. Israel has never experienced any rocket onslaught from Gaza remotely as intense as what Hamas and Islamic Jihad shot off on Monday and Tuesday. And yet, rather than respond with equal – or better yet – far greater force and teach Hamas and Islamic Jihad a lesson they would long remember, the security cabinet sufficed with a couple hundred pinpoint air attacks, and then accepted the IDF’s advice and opted for the ceasefire. In so doing, they left the residents of southern Israel virtual hostages of Hamas and Islamic Jihad who have retained the capacity to attack them at will. Defense Minister Avigdor Liberman’s sudden resignation on Wednesday may help his little party Yisrael Beitenu get reelected to Knesset in the next elections. But if it does, then Liberman will have won his political survival at Israel’s expense. Hamas is entirely justified in presenting Liberman’s resignation as proof that it defeated Israel this week. But beyond being frustrating and infuriating, the cabinet’s decision is a cause for deep concern. Why did the cabinet opt to stand down in the face of Hamas’s unprecedented onslaught? Leaving concerns about the prospect of war in the north with Iran, Hezbollah and Syria out of the picture for a moment, there are on the face of things, two basic explanations for the cabinet’s decision. First, maybe the WhatsApp jokes making the rounds are right. Maybe Prime Minister Benjamin Netanyahu and his ministers are a bunch of stupid chickens. Liberman effectively accused them of stupidity and cowardice at his press conference Tuesday afternoon when he announced his resignation. But there is no evidence that Netanyahu is stupid. To the contrary. As for fear, there is ample evidence that if he and his ministers were fearful, they have good reason to be deeply worried. This brings us to the second and more realistic reason to view the cabinet’s decision to stand down in the face of Hamas’s aggression as a bright red warning light. The source of that concern is the IDF’s General Staff. Israel does not seek to overthrow the Hamas regime in Gaza. And for good reason. The price of a war to overthrow Hamas would be exorbitant both in terms of the human and monetary cost of war. And the return would be dubious at best. Israel doesn’t have an army big enough to spare three divisions to control a post-Hamas Gaza. The other option often touted by the far Left is that Israel pay the price of overthrowing Hamas and then hand Gaza over to the PLO. The PLO, though, is no less hostile than Hamas. Israel has no interest whatsoever in empowering the PLO by giving it Gaza. Given the absence of a better alternative to Hamas in Gaza, rather than work to overthrow the terror regime, Israel has focused its efforts on keeping Hamas as weak as possible. And so, since Hamas took over Gaza in 2007, Israel’s effective strategy for dealing with the terror regime can be equated to mowing the grass. Every time Hamas becomes too powerful, Israel finds itself in another round of war with it. The purpose of Israel’s operations is to cut Hamas down to size and walk away, until the next round of war. But this week, Hamas made clear that Israel needs to mow it down. A terror regime capable of sending 500 projectiles into Israeli territory in less than 24 hours and destroying a bus with an anti-tank missile is a terror regime that has become too powerful. So why didn’t the cabinet order the IDF to mow the grass in Gaza? Why didn’t our leaders order the IDF to kill Hamas commanders Yahye Sinwar and Ismail Haniyeh? Why didn’t they order the IDF to destroy the rocket launchers and the crews that operate them? Why didn’t they order the IDF to destroy Hamas’s bases and missile depots? There are two possible explanations for their decision not to give these orders. Taken separately and together they point to an acute problem with the IDF’s senior ranks that requires immediate attention. One explanation has been highlighted by retired senior IDF commanders and Yediot Aharonot’s military commentator Yossi Yehoshua. This explanation argues that the cabinet decision to stand down on Tuesday owed to the General Staff’s refusal to take the actions necessary to cut Hamas down to size. The General Staff’s refusal, they say, stems from the role lawyers are now playing in the IDF’s targeting decisions. Since Operation Cast Lead in 2008-2009, military lawyers have been attached to fighting units down to the battalion level. These attorneys are allegedly prohibiting required action by claiming that strategically significant and operationally vital actions like killing Hamas commanders and bombing rocket launching units constitute war crimes. Chief of Staff Lt.-Gen. Gadi Eisenkot has demonstrated for years that he is willing to subordinate trigger pullers to attorneys who do not suffer the consequences of their lenient interpretations of the actions of Israel’s enemies. He elevated Military Advocate General Sharon Afeq to the rank of Major General. He supports indicting combat soldiers for alleged violent crimes on the basis of radical legal interpretations of actions in battle. The message Eisenkot has communicated to everyone from platoon leaders to division commanders is that they must subordinate their actions to the judgment of lawyers who have no command responsibilities. It is important to point out that the “international law” being implemented by IDF commanders through military lawyers is not actually the law as written. It is a radical, ideological interpretation of general principles of international law. For instance, there is no explicit, universally applied determination of what a “proportionate” response to aggression is. Everything is a judgment call. And the judgment that the IDF has internalized through its lawyers is the one pronounced by antisemitic UN agencies and antagonistic self-declared “human rights” organizations. Namely, that Israel is guilty until proven innocent. Needless to say, the IDF’s internalization of this bigoted and deeply flawed interpretation of international law is causing grave damage to the IDF’s ability to defend the country from aggression. The second, equally troubling explanation for the cabinet’s decision to stand down is that Netanyahu and his ministers don’t trust the IDF’s operational competence. For seven months, the IDF has failed to come up with ways to end Hamas’s operations along the border. The special forces operating in Gaza on Sunday were ambushed. Their cover was blown. And the IDF permitted a bus carrying 50 soldiers to enter a border area where it was entirely exposed to enemy fire. If this is how the IDF handles Hamas, how will it handle Hezbollah – which is 10 times more powerful? What are we to make of the fact that all the security services and branches of the IDF unanimously supported standing down in the face of Hamas’s extraordinary aggression? In other words, if Netanyahu and his ministers feared the outcome of a more forceful operations against Hamas and Islamic Jihad, their fears were well placed. Israel may be the innovation nation, but the IDF has failed to come up with innovative ways to deal with Hamas. To be sure, our special forces are undoubtedly exacting major blows at Hamas we never hear about. But the fact is, the terror regime shot off 500 projectiles and blew up a bus with a missile in less than 24 hours. The border assaults have never stopped. You can’t fight a booby-trapped balloon with an F-35. Ceramic vests and Iron Dome batteries are no substitute for bold improvisation and ingenuity. This then brings us to the question of what to do about Liberman’s vacancy at the Defense Ministry. There are three possibilities for filling the vacancy. The first is that Netanyahu just adds defense to his collection of ministerial portfolios which currently includes the foreign ministry and the health ministry. The main problem with this option is that given the acuteness of the problem, the Defense Ministry requires a full-time minister. Netanyahu is already working 20 hours a day. He can’t and shouldn’t try to take this on. 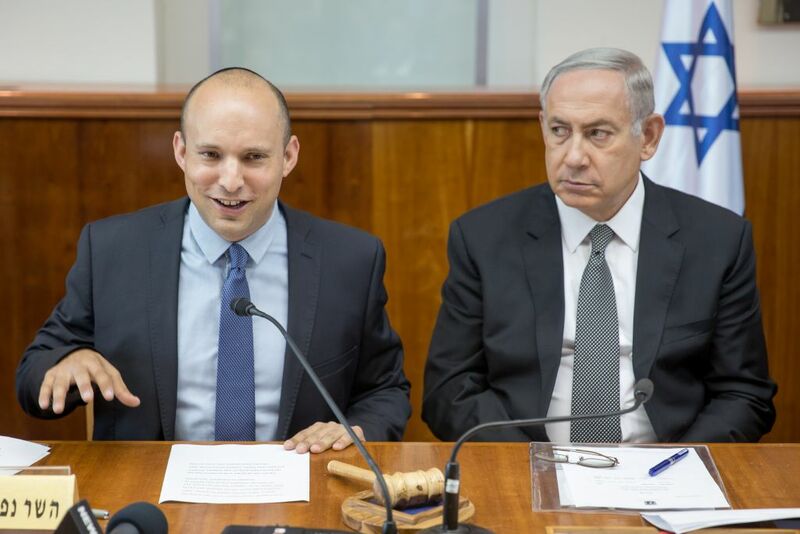 The second possibility is that Netanyahu appoints Education Minister Naftali Bennett to replace Liberman as Bennett’s Bayit Yehudi Party is demanding. There are pluses and minuses to this option. The main advantage of appointing Bennett is that he is the minister best suited to handle the challenge. Bennett understands the IDF’s weaknesses, particularly the General Staff’s lack of creativity and antiquated approaches to Israel’s innovative terrorist foes. As Education Minister, Bennett has demonstrated a capacity to enact significant reforms and work cooperatively and productively with powerful people that do not share his ideological outlook. He is more likely to deliver the goods than any other minister in Netanyahu’s government. The downside of appointing Bennett is that he is a politician and Israel is entering an election year. In election years, politicians have to be able to produce tangible results to voters. And it isn’t at all clear that Bennett will be able to do that. Indeed, he is just as likely to fail in his mission as succeed, particularly given that elections can be called at any minute. Taking the Defense Ministry is a major gamble for Bennett and his party. The third possibility is that Netanyahu appoints a person to serve until the next government is formed who understands the problems that need to be solved. That person would be someone with no political aspirations. He needs to be willing to walk straight into a political buzz saw at home and abroad as he removes legal advisers from IDF divisions, brigades and battalions and orders commanders to get the job done. This person needs to be willing to make a lot of people hate him as he cancels appointments of senior commanders and boots a lot of brass out of the IDF altogether. Frankly, it’s not clear that anyone who fits the bill exists. What is clear enough is that Israel’s enemies are sitting on our borders – in Lebanon, Syria and Gaza – and they are watching us and our General Staff. H hour passed when the missile landed on the bus on Monday. If we aren’t prepared to mow the lawn in Gaza – and Lebanon – today, then we need to fix what is broken here at home today. Because tomorrow they will strike us again. And tomorrow we may not have the option of walking away. The Jewish Home will leave the coalition, bringing down the government and forcing new elections, senior party sources told The Times of Israel Friday. The Jewish Home party’s decision came after Prime Minister Benjamin Netanyahu rejected Jewish Home leader Naftali Bennett’s demand to be made defense minister in a Friday afternoon meeting between the two. The sources said a date for elections had not been agreed upon. Elections are formally set for November 2019, but it is now expected they will be held between March and May, with Netanyahu pushing for a later date and other parties seeking an earlier one. Netanyahu said in a statement, however, that he would continue to try to preserve the right-wing coalition. Netanyahu “stressed the importance of making every effort to preserve the right-wing government and not to repeat the historical mistake of 1992 when the right-wing government was overthrown, the left came into power and brought the Oslo disaster to the State of Israel,” according to the Prime Minister’s Office. Netanyahu also told Bennett that “the rumors that a decision to go to elections had been made were incorrect,” the statement said. Bennett said Thursday he had asked Netanyahu for the portfolio after Avigdor Liberman resigned the post on Wednesday. The party said this was an “ultimatum” for it to stay in the government. By pulling his Yisrael Beytenu party out of the coalition, Liberman left the government with a narrow majority, with just 61 out of the 120 Knesset seats. The religious nationalist Jewish Home party then quickly declared it would topple the government if its leader Bennett is not given the defense portfolio. With no Jewish Home, the coalition would go down from its paper-thin majority of 61 seats, which it currently holds without Yisrael Beytenu, to just 53. The government must have the backing of at least half of the 120 seat Knesset to survive no-confidence motions. While in theory Netanyahu could bring another party into the coalition instead of Jewish Home, all opposition parties having declared their intention to run against him and the possibility of them joining is highly unlikely. Bennett has long criticized the Netanyahu government’s reluctance to respond more forcefully to Gaza rocket attacks, and has advocated ground incursions into the Gaza Strip. Liberman, quitting the government, said he was doing so to protest Israel’s acceptance of an informal truce Tuesday that put a halt to the latest Hamas-Israel escalation in which Hamas fired over 400 rockets into Israel. But the Jewish Home sources said it was too late and that the rejection of the party’s demand to be given the defense portfolio meant elections were inevitable. Malaysian Prime Minister Mahathir Mohamad warns moving embassy to Jerusalem could increase terrorism threat • Citing Mohamed’s history of anti-Semitic remarks, Australian treasurer insists Canberra will make its own decisions • Move makes sense, he says. Australia’s treasurer on Friday said Malaysian Prime Minister Mahathir Mohamad had a history of anti-Jewish statements, in an escalating war of words over the possibility Australia might move its Israeli embassy to Jerusalem. Malaysian Prime Minister Mahathir Mohamad raised the potential embassy switch in a meeting with Australian counterpart Scott Morrison at a regional summit in Singapore on Thursday, later telling reporters such a move could increase the threat of terrorism. Malaysia’s film board rejected the movie as Zionist propaganda at the time. “I do not conflate the issues,” Morrison told Australian Broadcasting Corp. Some 60% of Malaysia’s population is Muslim. Speaking on Friday, Morrison confirmed Mahathir had raised the subject of the embassy but declared that only “Australia determines Australian foreign policy. “I think what Josh said today was filling in the history of his [Mahathir’s] record on various issues over time,” Morrison told reporters on a visit to Darwin, where he is due to meet Japanese Prime Minister Shinzo Abe. Australia and Malaysia have had a sometimes rocky diplomatic relationship. The two countries clashed 25 years ago when former Australian Prime Minister Paul Keating called Mahathir “recalcitrant” for boycotting the 1993 Asia-Pacific economic forum.